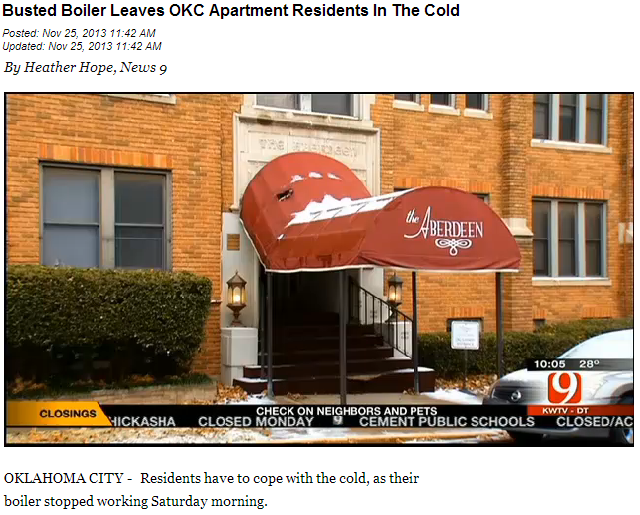 No heat all weekend in the Aberdeen condos near downtown Oklahoma City. Residents have to cope with the cold, as their boiler stopped working Saturday morning. On Saturday, a plumbing pipe broke in the boiler leaving the historic seven-story building in the Heritage Hills neighborhood in the cold. Some say they are doing all they can to stay warm by simply wearing more layers or using their stove. Lugging heavy bags of logs is Linda Atchley’s fix for the cold. “We decided to buy firewood to start a fire and make some soup and snuggle up by it,” said Atchley, who’s lived at the Aberdeen for 11 years. Steam energy is a popular energy source for heating systems in buildings because steam is a relatively cheap, yet effective energy source. However, heating systems that depend on steam energy can be dangerous if the safety mechanisms, such as a durable Spence PRV (pressure reducing valve), are in poor condition. Steam contains both latent energy and potential energy. While steam is used to power machinery, it makes use of its latent energy. When the steam is left in the pipe unused, the energy is “stored” within the pipe as potential energy. Potential energy from steam can be dangerous as it can easily elevate the pressure within a pipe. When the pressure exceeds the capacity of the pipe, the pipe will burst, damaging the steam system and potentially injuring anyone nearby. If the pipe does not burst due to the pressure itself, the pressure can also cause any condensate (liquid used to create steam) in the pipes to rapidly move within the pipe. This problem is known as water hammer or steam hammer and can easily deform pipes or cause them to burst. If your pipes are starting to become deformed or noisy, your steam system might be suffering from high-pressure water hammer. Fortunately, many reputable industrial suppliers like ALB Industrial Supplies Inc. carry a wide range of Spence products that reduce the pressure within pipes. If your safety components need to be replaced, do not hesitate to call and see if you can find the part you need.